We provide our customers with a free online GPS Tracking Website that can track all of our excellent GPS Trackers. We provide a full step-by-step guide with our detailed manuals. Don’t get led astray by companies charging the earth or not giving detailed information about actually getting your GPS tracker to work! We make it all much easier with clear, detailed information. Yes, human error can happen, but we’re always here to help where you might be getting stuck. Setting up a GPS Tracker with an online GPS Tracking website can be a nightmare – you need to set specific variables depending on your tracker, GPS Tracker SIM card and online GPS tracking website. We make it so simple you’ll have it done in literally a couple of minutes. We provide details of the specific texts you need to send to your GPS tracker, depending on your tracker and SIM card. If you have a SIM card outside of the UK, then simply email us and we’ll give you the texts you need to send to your GPS tracker. Some companies charge a monthly fee for online tracking – we make it free. Follow the simple instructions, and you’ll have your own website to log in to, and see your GPS Tracker tracking online. It has a 30 day history. 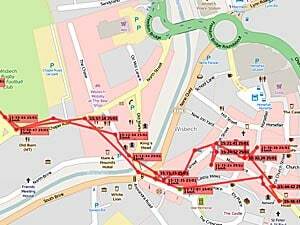 How does an Online GPS Tracking Website work? With a data enabled GPS Tracker SIM (which should cost no more than £5 per month for unlimited texts and data use), your GPS Tracker will be able to upload its location information to the online GPS tracking website. The website then interprets the coordinates to a map location, which you can see in real-time. It stores the points and connects the dots, so you can see where your GPS tracker has been. You can send a text message to your GPS tracker to change the upload interval – you may want it to be every minute for example, or every hour. The online GPS tracking website is able to individually identify your tracker by the phone number of the SIM inside, as well as the unique IMEI reference number of your GPS Tracker. If you find the text commands too fiddly, or have any problem setting up your GPS tracking with our free online GPS tracking website, then we’ll help. For example, your SIM may be for a country outside the UK, or somehow you can’t see your GPS tracker tracking online. There may be a problem with the APN, username, password or format of phone number. We solve queries like this all the time and enjoy getting our customers set up with online GPS tracking! Its a service you’re unlikely to find anywhere else – we understand that GPS trackers for dementia and online GPS tracking websites can be a bit fiddly, and are more than happy to help out. So – buy a GPS tracker from us, and enjoy your own free online GPS tracking website.